When I first learned about wrapping, Uppymama was the epitome of luxury at the time. 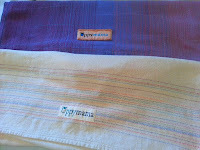 I drooled over these beautiful handwoven wraps, and was so excited when I won a ring sling by this amazing Canadian company (see: Uppymama Linen RS). I stalked, and entered draws, and watched prices, and agonized... and finally I pulled the trigger and bought an UppyMama wrap in my base size from a swap page. 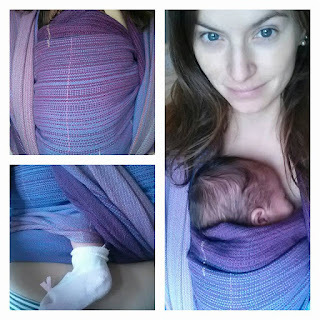 This wrap is Deep Waters, which was a custom colourway for a small group of parents, and only five of these wraps were woven. Of those, mine is the only one that has a fuchsia weft, so all of the others are pre-dominantly blue, whereas mine has more of a purple hue to it. At the time it arrived I was primarily wrapping my son, who was about 18 months old. 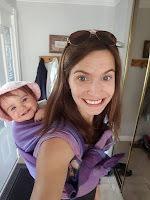 We mostly did front carries with this wrap for bedtime walks and snuggles, as he was not much of a fan of back carries at the time. I did not find any digginess with this wrap at all, despite it being relatively thin. For back carries, I often used it in a ruck tied knotless, and found it comfortable for relatively long periods of time. When Little Miss arrived on the scene, this wrap was immediately a favourite. It is soft and was immensely comfortable for front carries at the ittybitty stage. It is the perfect colour and length for us, even at over a year old now. We still use it nearly daily for fwcc and double hammock tied at the shoulder with a candy cane chestbelt (our fave!). Squishy, tiny, Little Miss... oh my ovaries. This is an older Uppy, and they are known to be slightly heavier weight than newer Uppys. This wrap is strong, thin, and resilient. It has the perfect amount of grip, glide, and cush. I do not worry about wearing it on any occasion, as it is easy to wash and comfortable for any period of time, with any size of child. It has comfortably rucked my now three year old son in parking lots, and dragged its tails along wilderness paths. We will keep this wrap until our wearing days are done, and at that time might even keep it as a cherished momento of all of the snuggles it gave us. Prices have significantly declined and rare unicorn Uppys such as this one pop up all the time at insane prices, under retail most times. If you see an old cotton uppy and are on the hunt for a versatile wrap that can take anything you throw at it, then I strongly encourage you to buy it! Recommended for: Everyone. Seriously. Buy the old Uppys.